SUBHEAD: A reflection on how making society more resilient may be worse than doing nothing at all. 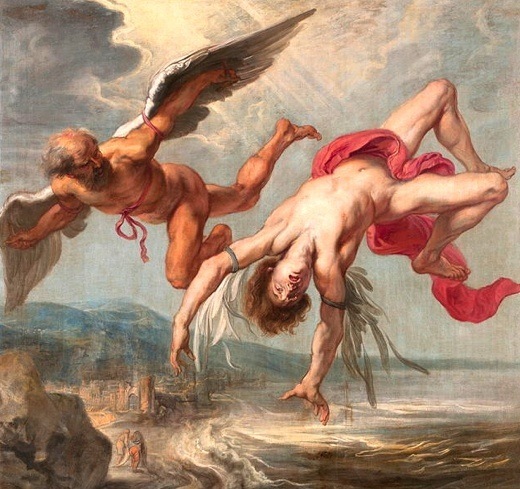 Image above: Detail of painting of legend of Daedalus and Icarus by Jacob Peter Gowy (circa 1635) in the Prado Museum. From original article. See (http://commons.wikimedia.org/wiki/File:Gowy-icaro-prado.jpg). What if Icarus’ father—knowing his son would fly too close to the sun—had made the wings he designed more resilient? What if he had used bone and string and not just wax to bind them? Would this ancient myth have turned out any differently? Probably not. Icarus would have simply flown closer to the sun before the sun destroyed his wings—perhaps igniting them on fire rather than just melting the wax. And so the boy would have fallen even further and have been crushed even more brutally by the onrushing wall of ocean below. Let’s apply that question to today. What if we make our globalized consumer society more resilient? That is to say, what if—as more people in the sustainability community are advocating—we make our economic and social systems more able to withstand the inevitable shocks that come with an ever larger human population living within a destabilizing Earth system. What if we build future coastal homes on stilts. And invest billions of dollars and massive amounts of natural capital (in the form of cement and embodied fossil fuel energy) in sea walls around cities like New York and New Orleans. And we even genetically modify crops—even livestock—to withstand drought and heat. What happens then? We fly higher, we grow bigger, and our inevitable crash into the sea is delayed temporarily. But as with Icarus, the crash would be made far worse. These technologies may delay civilizational collapse a few decades. If that’s the difference between 2030 and 2050, that might mean a peak population of 9.4 billion instead of 8.3 billion, a number far harder to sustain—even without the productivity losses that will come with a changing climate. This delay might also translate to an overall temperature increase of 5 or 6 degrees Celsius rather than just 3 or 4 degrees, which could mean the difference between meters and tens of meters of sea level rise and the difference between millennia of misery and just centuries. Yes, I recognize this isn’t the technological utopia that futurists promise. There will be no robot slaves to make living easy; no intelligent computer operating systems that simplify our lives and also double as romantic partners for the lonely. Life will be harder—humans will probably labor more, including in simple day to day chores, but hopefully this simplification will prevent dystopic futures portrayed in movies like Soylent Green or Snowpiercer. Naturally, we’d use some high technologies—appropriately: solar panels on tops of homes for example, but probably not in such densely concentrated arrays that they incinerate birds flying overhead; antibiotics—for life-threatening diseases, but not in ways that make bacteria more resistant (or should I say more “resilient”? ); bicycles; zero net energy buildings; composting toilets; wind turbines—perhaps once again for moving water, grinding grain, and sawing wood more than for producing electricity; and the list goes on. But a lot of modern luxuries would be phased out. The challenge is ensuring that all our efforts to become more resilient make us more sustainable—and vice versa. But even if we fail at that, we should still work to stop any ‘resilience’ projects that serve to extend the reach and robustness of the consumer society. That, at least, may help cushion our eventual fall when we crash into the proverbial sea. IB Publisher's note: Overall I think this is a useful article. However, I take exception to one point made. It is described in a comment I left on the Resilience website. See below. I think the author (like a few others) has confused solar photo-voltaic panels for directly generating electricity with solar reflective panels for heating water to generate electricity. Assadourian writes: "Naturally, we’d use some high technologies—appropriately: solar panels on tops of homes for example, but probably not in such densely concentrated arrays that they incinerate birds flying overhead." His link does not refer to a PV system killing birds. PV systems do not incinerate birds. In fact they don't reflect much light at all - they absorb light. I'm not aware of any residential rooftop mirrored solar concentration systems for generating electricity. I have a rooftop PV system in the tropics and even insects like dragon flies and butterflies are not injured in bright sunlight over the panels.